Sometimes God leads us to speak the truth and that can get us in trouble. *Online Resource Holding up the light (Grundy) A great song for all about being brave enough to hold a light, no matter how small, when all around seems dark and difficult. Sound sample and purchasing options. Youtube. Good for kids. *TiS 689 / ATE 286 / GtB Lord hear my praying, listen to me / Sorrowing song. (Mann) Powerful words of prayer to a simple tune. Words are straightforward about asking difficult questions of God. Lyrics (loads a pdf). Sound sample. This song will work for next week as well, so now is a good time to introduce it. God as judge, desiring justice. 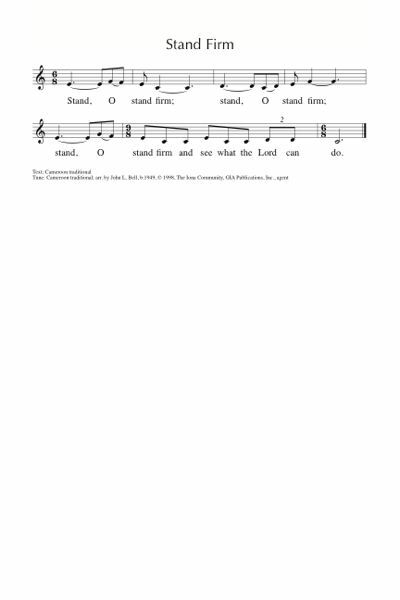 Iona (M&G) / CH267 Blessed be God blessed be God for ever (Martinez) Beautiful words to a beautiful, but tricky Philippino melody, unless you have a Philippino congregation, in which case it's just a familiar folk tune (DANDASOY). This would be great to ask a small group to sing, if you have some good singers in your congregation. Works nicely with a guitar. AoV1-083 / GA036 / GtG763 / G(II)46 / GC48 / GC(II)33 / G(3)047 / PfAS082B / URW257 / Lau892 The Lord Hears the Cry of the Poor (Foley) The chorus for this makes a very good refrain for this Psalm, as set in PfAS. Sound sample and lyrics (including verses). Emergent Psalter You are gods all of you (Everett) A very different verse to focus on in this simple refrain. Sheet music (refrain only). God's word is very near; follow and prosper. *G(II)363 / GC518 / URW417 The Word Is Near You / The Word Is in Your Heart (Moore) I would use the chorus of this alone as a reflective chant. Lead sheet. Fast sound sample. Iona (Enemy of Apathy) / A&M466 / SP223 / StF654 / MP940 The love of God comes close (Iona) A good song of God's forgiveness. Simple melody. *Online Resource I Lay Open (Psalm 25) (Bruxvoort-Colligan) A calm reflective chant that could be used as a responsive refrain, or as a devotional prayer. Sound sample & contact details for sheet music. *ATFG563 / NCYC'03 / The Red Book How long must we cry out? (Mann) This is a big Brunswick favourite, great for young people in particular. "Teach me to do what is right, walk in the darkness, trust in the light and may love be the path I walk upon". Good for teenagers. *TiS 666 / AoV2-113 / AoVK-126 / ATOK 409 / NCH526 / Iona (Common Ground, Freedom is Coming) / CH516 / VU646/647 / WoV650 / ELW866 / A&M483 / SFFS 2235 / HPP153 / GtG853 / G(II)357 / GC513 / GC(II)516 / G(3)594 / Cha442 / SP235 / Srce737 / StF483 / MP954 We are marching in the light of God / Siyahamba / Caminando (South African) A very popular chorus, with possible alternate verses, depending on your source. Sometimes people get anxious about the word "marching", but remember that this song comes from apartheid-era South Africa, where people were protesting so that they could vote in their own country. And the marching is toi-toing, much less militaristic than what you may imagine. Good for kids. *Emergent Psalter Let me know your ways (Everett) A really good psalm response. I just love this book - I think I like every Psalm in it. Sheet music (refrain only). NCH Psalter 25 Your mercy and love have been from of old (Judy Hunnicutt) A lovely simple Psalm refrain. 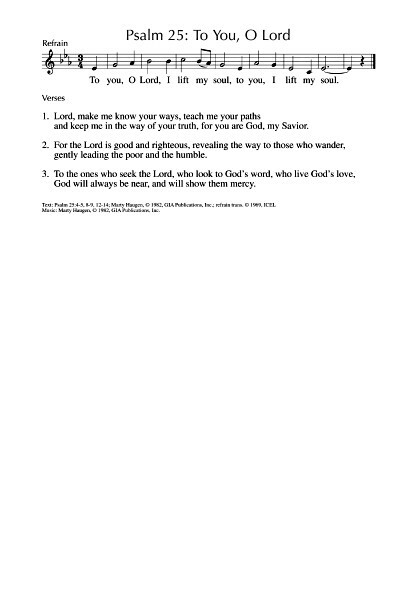 *Linnea Good Make me know the path (Good) A lovely simple psalm response. Good for kids. *Online resource Make me know your ways (Harding) A nice laid back and groovy Psalm response or chant. Can work as a round, too. Sound sample, sample PDF and purchasing options. Good for kids. *Iona (WWHW) / MV223 We will go with God / Sizohamba naye (Traditional Swaziland) A simple song from Swaziland. Good for the end of the service. Sound sample. It would be good to sing this at Brunswick again. Note that MV has a different translation. Good for kids. *VU752 / G(II)34 / GC36 / GC(II)26 / G(3)039 / PfAS025A / URW248 To you O God I lift my soul (Haugen) Simple lilting cantor and response "To you O Lord I lift my soul, to you I lift my soul". Lead sheet. Sound sample. 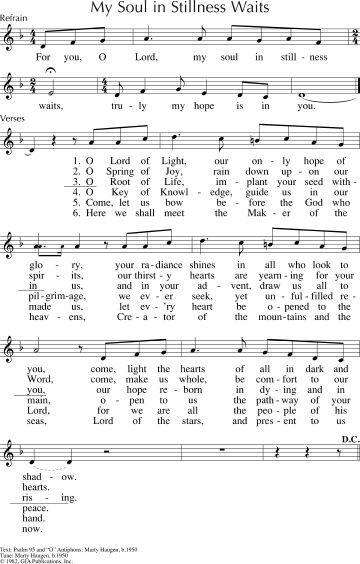 AoV2-014 To You O God I Lift Up My Soul (Hurd) I like this; it's pretty groovy, and has good lyrics; you could also use the chorus on its own, or with a read version of the Psalm. Sound sample and lyrics. TiS 14 / GA026 To you, O Lord I lift my soul (Willcock) Good cantor and response. *Taizé / CH276 / VU22 / GtG090 / ELW262 / GA283 / A&M053 / G(II)256 / GC332 / GC(II)340 / G(3)406 / CP094 / W&R166 / PfAS037B / SP28 / URW396 / Lau088 Wait for the Lord (Berthier) "Wait for the Lord whose day is near, wait for the lord, keep watch, take heart". A lovely simple Taizé chant. Some older versions are not inclusive. Sheet music, translations and sound samples. Thanks for the community, thanks to God for forgiveness of sins. ATFG561 / Tune In Community (Brown) A song about being welcomed and part of a community. Sound sample and lyrics. Good for kids. 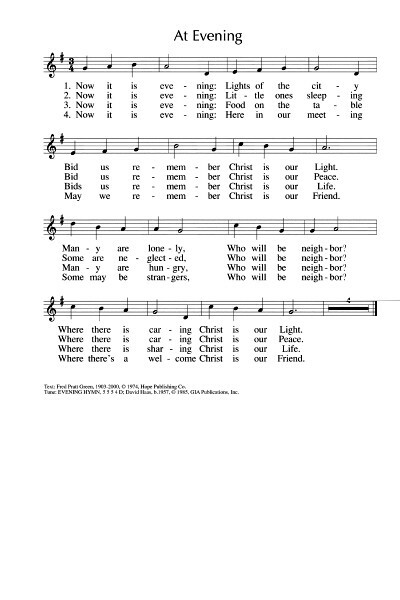 MV145 / CP418 / SP&P123 Draw the circle wide (Light) A great song about welcoming all people. Chorus is “Draw the circle wide, draw it wider still. Let this be our song, no-one stands alone, standing side by side, draw the circle wide”. Iona (Love From Below) / A&M297 / SFFS 2283 / GC(II)786 / G(3)885 / SP114 / StF746/ Lau387 For all the saints who’ve shown your love (Bell) These beautiful lyrics are some of the best words about All Saints' Day that I've come across, and would work for this reading too. There are two tunes, and two slightly different sets of lyrics. Love From Below uses the tune "ALL SAINTS" which is a John Bell original. A nice tune, but not familiar, although not hard to learn at all. The Gather hymnals publish a slightly different version of the lyrics, sung to the tune O WALY WALY which is the tune for "The water is wide", so much more familiar. Lyrics New words to old tunes. TiS 549 / AHB 456 / CH538 / A&M642 / VU430 / CP(E) 439 / 82Hml-694 / Lau914 God be in my head and in my understanding (Davies) I like these words From the Book of Hours, but I have never been able to work out when you might use it in congregational worship. Perhaps sung just before the sermon? If you use this song, please comment - either here, or in the Facebook group. 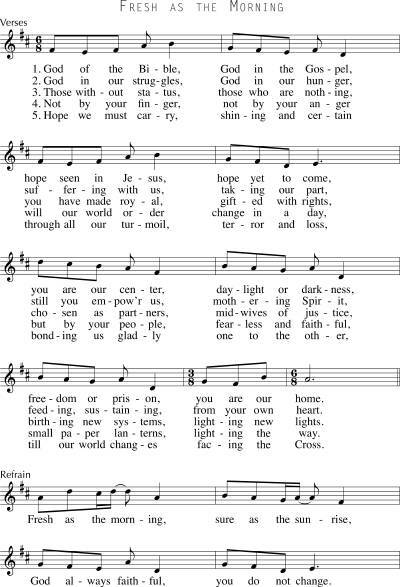 If this is new to your congregation, I think it would need to be taught, but it is very short so could be sung a few times. "God be in my mouth, and in my speaking" I'm going to suggest this again next week, so you could sing it two weeks in a row so people can get to know it better. Lyrics and tune sample . Susan Bloomfield, a reader of this site has also offered this fun tune which makes it pretty Good for kids. Please contact her through her website if you use it. AoVK-28 / ATOK 376 Faith hope and love, this is what we long for (Watts) A groovy, easy, fun song. Good for kids and youth. Love your neighbour, love God. The Good Samaritan. NCH541 They asked “Who’s my neigbor and whom should I love?” Great words from Jan Wesson, and a simply folkish tune that’s a bit like Sydney Carter’s hymn tunes. Challenging words that pick up the good Samaritan reading, but also very appropriate for this week’s reading. TiS 629 / AHB 558 / AoV2-136 / ATA 197 / CH544 / VU600 / Lau888 / StF256 When I needed a neighbor were you there (Carter) A classic folk church song. Well known and fits well with this theme. "And the creed and the colour and the name won't matter"... Lyrics. Good for kids. TiS 640 / AHB 561 / ATE 310 / NCH498 / UMH432 / VU593 / WoV765 / ELW708 / HPP446 / GtG203 / PH367 / G(II)296 / GC409 / GC(II)429 / G(3)505 / CP504 / W&R273 / Cha600 / URW116 / 82Hml-602 / Lau241 / StF249 Jesu Jesu fill us with your love / Kneels at the feet of his friends (Colvin & people of Ghana) Lyrics. Good for kids Oldy-but-a-goody. God Gives 1: Love the Lord your God with all your heart and all your soul and all your mind and love all humankind as you would love yourselves and…. I really like this old Sunday School round, with a groovy 50s feel to it. Great for kids. CH115 / MV089 / Iona (Love from Below) / A&M722 / SP292 Love is the touch of intangible joy (Robertson / Bell) Great words and a simple tune. "God is where love is, for love is of God". Lyrics (scroll). Online resource The Good Samaritan (Dietrich) A funny song for kids (and adults!) to listen to with a cool video. ELW341 / SFFS 2187 / G(II)549 / GC759 / GC(II)752 / G(3)857 / W&R627 / Cha471 / Lau675 Now it is evening / At evening (Pratt Green) A song of justice and caring for others who are lonely, hungry in the city. The set tune is really good and simple, but it can also be sung to BUNESSAN New words to old tunes. Mostly makes sense for evening services only, but maybe it could work in the morning…? Lead sheet. Sound sample. *MV031 / Linnea Good Pure love A simple two-part chant that picks up the Psalmist’s idea of the purity of God’s law “Pure love, pure truth, pure justice, God”. Would be great if you can teach it to some of the congregation before worship starts. Good for kids. Please join the conversation and add your suggestion or response below! Now it is Evening is #572 in ELW. Thank you Natalie. 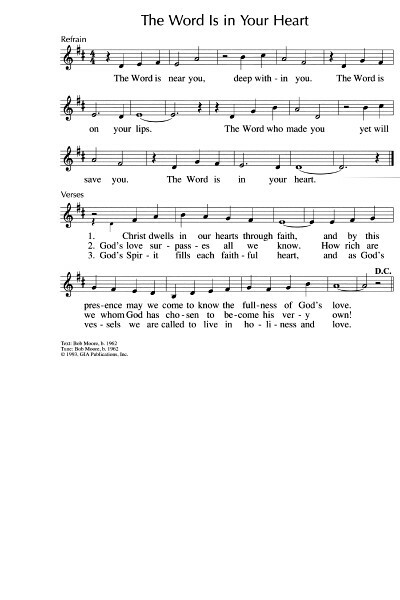 Such a wide spectrum of hymn resources. I am very grateful for the suggestions. Yes! "When the Poor Ones" is going to be a choir anthem this Sunday. Great suggestion.